Instead, I loved it. It was one of the first DVDs I’d seen in months that I immediately wanted to watch again. And this, from a movie commonly reviled, a flop, a real stinker. Yes, the story is a pastiche of every common hard-SF space-flight plot device you can think of from 20th century SF novels and films. The friendly alien. Frantic efforts to repair a decompressing spacecraft damaged by micrometeorites. The doomed astronaut adrift in space with only his space suit to keep him company. DNA seeding of prehistoric earth. Spin-generated artificial gravity. Symbolic jewelry on a chain. A 3-D planetarium. We’ve seen it all before. But we haven’t. Not with these production values. And not with this ballet-like pacing. Yes, Kubrick broke the mold when he chose THE BEAUTIFUL BLUE DANUBE to accompany the shuttle/space station rendezvous in 2001. But the steady pacing of scenes in MISSION TO MARS is almost hypnotic. Watch the astronauts exit their doomed spacecraft. 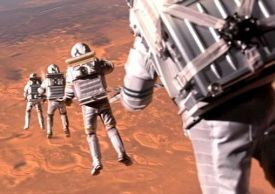 Compared to the transfer from the Russian spacecraft to the Discovery in 2010, the scenes in MISSION TO MARS are like poetry. And I dare you not to be moved by Tim Robbins’ actions as he drifts away just out of his wife’s reach as they orbit just above the red planet’s atmosphere. I even loved the music. Totally unusual for a movie of this type, Somebody was really thinking, hey, this is gorgeous stuff we’re illustrating here, let’s not overwhelm with STAR WARS type paroxysms of marshal music. Who is responsible for this? Brian DePalma, that’s who. It looks and sounds like he let his people create. Yes, there a plot holes. But I loved the holographic alien and the DNA-earth-seeding sequence. I even loved the tear in her eye as she recreated the destruction of ancient Mars. If I had to choose one scene that I will remember forever, it is the planetarium scene with the lift-off of hundreds of tiny ships from ancient Mars. This to me is a triumph of special effects in service of story and emotion, not just special effects servicing a visceral kick in the teeth. When all is said and done, that’s probably why this movie failed. It’s more of a dreamer’s movie at a time in our culture when the crack of bone and splash of blood are expected. Listen to the DVD commentary and you sense the incredible pride the technical people have in what they created here. It’s a pity it wasn’t more commercially successful, but at least we have this wonderful DVD.